I will start out this posting by saying that I hear the universe speaking to me each and every day without fail. If you choose to call it God, or Allah, or Jehovah, or spirit, these are all so real and I accept that. Its just that sometimes it is so clear that it is daunting. Yesterday I had a powerful day inside of my mind and I felt that it needed to be written about before it got away. The picture above explains it all. You might be saying, "Huh, How does that picture explain everything?" Let me explain. 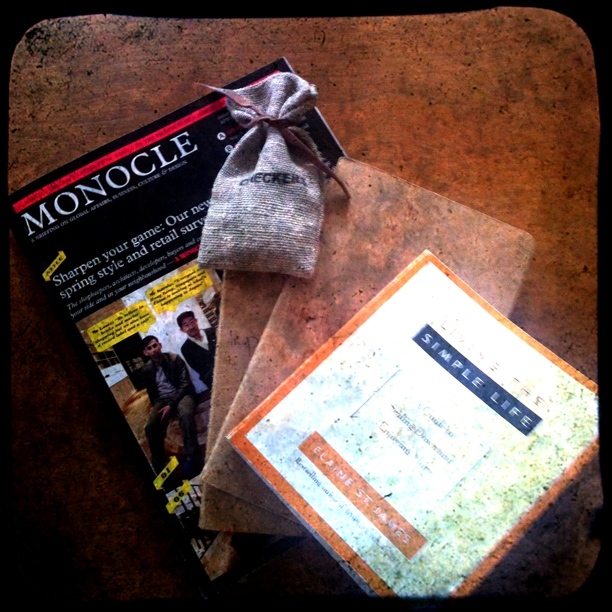 First of all, one of my favorite magazines to read is Monocle magazine. Its a magazine about global affairs, business, culture and design. The pictures are nicely done, the pages are thick and kind of industrial feeling, and the information is always just so interesting. I had a subscription a couple of years ago and I just loved it. I have been purchasing them one by one recently and they are a bit pricey. The issue above is The April issue. I did not buy it, I found it. The two journals beside it are full of Spanish grammar notes from lessons that some man or woman were taking possibly recently. I found these too. The book to the right of the journals is called,"Living The Simple Life, A Guide To Scaling Down and Enjoying More." I found this book too. Lastly, the little satchel is stamped with the word "checkers", and inside there are wooden round pieces that are in perfect condition. Yes, you guessed it, I found them too. Now here comes the money sentence!!!!! I found them all together in one pile a block form my home. Yesterday I was in a book store and I said to myself that i really wanted to read this months issue of Monocle, yet I did not buy it because there were other things that were more important and pressing in that moment than this $10 magazine. I told myself that I would have it somehow soon. I also told myself that I should play even more than I normally do going forward because every time I play for an extended period of time, I stumble upon some great idea for another project or a functional item or even a new song. When I say "play", I mean doing something that you "want" to do, not that you "have" to do. Also something that just makes you feel light and free inside. I was getting too serious with my ebook coming out and everything and some other basic life things that were feeling too heavy. Recently, I have also been missing my actual journal writing. I have some beautiful journals and I love to write in them. I just get so stimulated by the "doing" of life that I don't take the time to get it down on paper. What I am doing now is not the same as the pen to paper. That will always be the most powerful method, in my opinion. I have also been heavily thinking of strengthening my language skills even further. I speak quite a bit of Spanish and Italian, yet when you don't use it, the muscle weakens as with anything. Finally, I have been telling myself that I really need to purge all of the things around me that are not serving me or that I am not using. This is something that I am very serious about right now. Each day or so, I release something from my life that I have not used or that is not functioning well. The changes that take place following this action are immeasurable. So when I came out of the train and I walked up on this bundle of magic, I was just completely moved and dumbfound. This kind of thing happens and we are prone to say that it is coincidence most times, but I just cannot see it that way. This was just too much at one time. This was magic, this was all of the signs that I need to see at one time. The universe spoke to me and it chose to do it in 5 separate ways in the form of a little package or psychological "happy meal." I am grateful, so very grateful. The universe spoke to me and I heard it loud and clear. I feel a trip to Europe coming on.Take the day by storm.